we are happy to introduce you the recent updates. This feature is especially dedicated to newbies but can also be useful for experienced players. It basically shows you how to get to places which many newbies don't find in the first place. This is a new class in which you can play as a lumberjack. You have a truck which you can fill with woods which you get after you have cut a tree. It is your decision how many trees you want to deliver. But watch out! 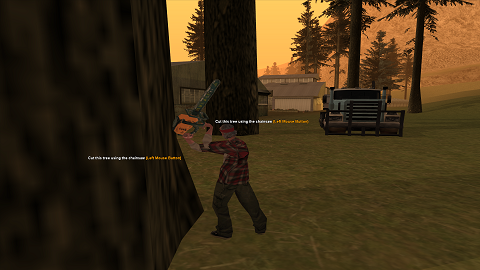 Other lumberjacks could be faster than you so you do not get any trees. We know our server already provides a lottery but we have decided to make another one which is more fair for players. of winning). After 2 hours someone will be chosen as the winner who will get all the money which was in the pot! into the chat. The winner will earn money and score. I hope to see you in the server soon! I'm not an english native speaker. Thank you for correcting me with no offense and insults. NICE UPDATE KEEP IT UP!! Current time: 04-22-2019, 02:03 AM Powered By MyBB, © 2002-2019 MyBB Group. Enhanced By CloudFlare.